The amazing, healing, balancing restorative properties of herbs and plants never cease to amaze me. I’m always researching botanical and herbal remedies to use on myself and for my clients. I’ve long been interested in Ayurveda; one of my favorite sayings is a piece of Ayurvedic wisdom: Eat until you are eight parts full. So when I learned that, according to popular Ayurvedic folklore, triphala is able to care for internal organs like a mother would care for her children (No mother? Do not worry so long as you have Triphala, the saying goes) I decided to research further. 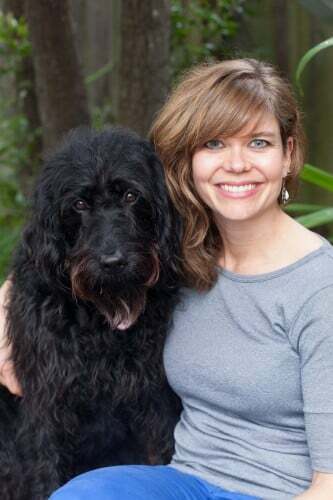 I specialize in digestive wellness, and that means I help people overcome symptoms such as bloating, gas, constipation, and irregular bowel function. I always recommend stool testing and breath testing to check for parasites, yeast, SIBO, or pathogenic bacteria, or to detect any microbiome imbalance that may be causing the person’s symptoms. While we’re working on diet and rebuilding a healthy internal ecosystem, I may recommend various herbs and nutrients to help establish balance and relieve symptoms. Turns out that triphala is one of the best herbal concoctions to support healthy digestion. Triphala’s benefits are many, but it’s commonly used as a gentle, detoxifying bowel tonic. It’s been used for over 2,000 years and is a staple in Ayurvedic medicine, used to balance the doshas. Triphala contains five of the six tastes recognized in Ayurveda: sweet, sour, bitter, astringent, pungent. Salty is the sixth taste. The idea is to include each of the six tastes at every meal for balanced health. I use triphala primarily as a GI tonic, but it does have many positive benefits for the entire body. Amalaki: rich in vitamin C (highest known natural source, actually), amala is has a mild laxative effect and is beneficial overall for digestion. Also a great tonic for the liver, it’s restorative and has anti-inflammatory properties. Haritaki: good for constipation, also has anti-diarrheal properties. Detoxifying, promotes absorption of nutrients. Bibhitaki: used to treat diabetes and high blood pressure. Combats excess mucous in the system. Purifies the blood; nourishes skin, hair, and eyes. Triphala offers the biggest benefit to the digestive system. It promotes regularity, combats constipation, and is said to cleanse the colon by pulling toxic residue from intestinal walls. 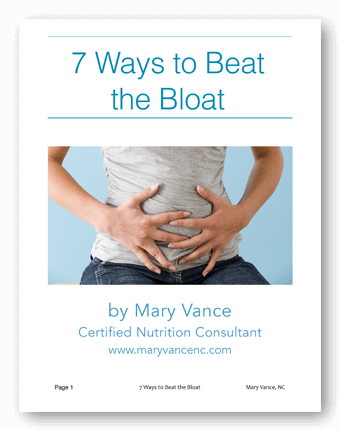 I commonly recommend it to my SIBO and hypothyroid clients struggling with constipation. It’s the perfect herb to offer relief in the short term until the underlying dysfunction is corrected. Reduces cholesterol: rat studies show that triphala “significantly lowers” cholesterol (source). I suspect this is because it is super anti-inflammatory, and high cholesterol can be a result of systemic inflammation. Triphala also has a positive influence on regulating the bowels, and regular elimination is important for healthy cholesterol levels. If you’re constipated, waste (stool) in the colon that has bound up hormones, toxins, and fats for excretion can be reabsorbed into the system. Triphala also supports liver detox which is beneficial for healthy cholesterol. Relieves constipation & cleanses the colon: as mentioned, triphala improves bowel motility and tonifies and strengthens the intestinal tract and colon. Has a mild laxative effect, but it’s not habit-forming like some of the harsher herbs. 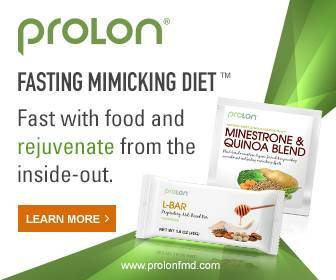 Improves overall digestion and assimilation. Promotes internal cleansing and supports detox. Relieves stagnation associated with constipation. Anti-inflammatory: because triphala is so antioxidant-rich and filled with beneficial phytonutrients, it has potent anti-inflammatory powers. Inflammation is present with nearly all disease, so anti-inflammatory support goes a lot way. There’s even evidence that triphala kills cancer cells and could be promising for use in cancer treatment (source). Skin. hair, and eye health: triphala’s potent antioxidants can help rejuvenate skin and hair and improve vision and eye strain. Because it strengthens the GI system, you’ll better absorb nutrients and fatty acids that support skin and hair health. (source) I’ve read you can use triphala as a eye wash for cataracts and glaucoma along with taking it internally. I’ve also found that triphala can support weight loss by keeping the body nourished and balanced, therefore regulating appetite and blood sugar, but I haven’t found much support to back that up other than anecdotal reports. 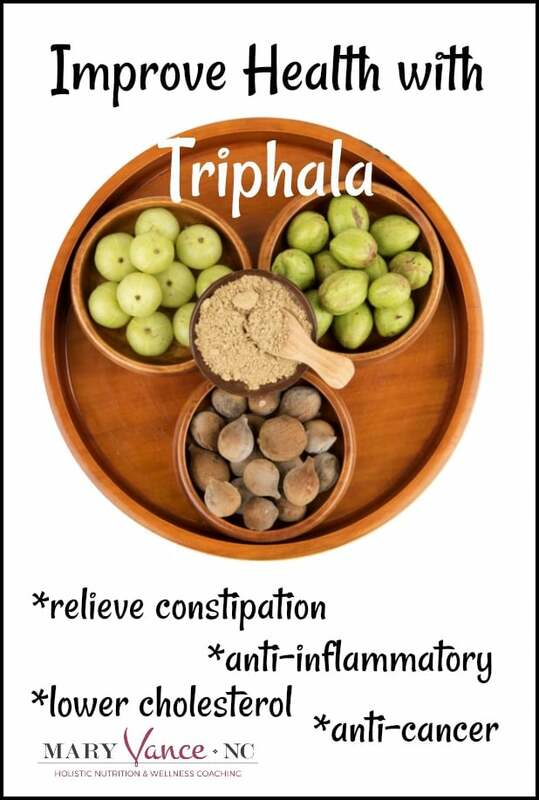 I most often recommend triphala for digestive issues, primarily constipation. The other benefits are the icing! You can also take it as a tea for overall balance, cleansing, and wellness. I usually guinea pig myself before recommending supplements. I’ve been using triphala for 3 weeks now and have noticed a pretty remarkable difference in elimination. Clients have noticed better formed stool and improved regularity that has resulted in better energy and reduced bloating. I do think overall it helps increase absorption of nutrients and definitely supports regularity. For constipation, I recommend this supplement because it contains both triphala and magnesium, which is another great supplement for regularity. Take 2 before bed, away from meals. If that doesn’t work, take 3. You’ll need to “train” yourself to poop regularly if you’ve struggled with constipation, so in the AM when you get up, have a hot beverage like green tea or hot water with lemon, and make time to sit on the toilet. Eventually you’ll create a routine for yourself and poop at the same time daily. The most important element is to determine what is causing the constipation so you can address that. For overall wellness and balance you can take it as a powder and mix it with water or tea. This way you really get the 5 taste benefit. This is the best way to take triphala as an overall tonic and for dosha balance. You would take up to 1/2 teaspoon in about 8oz hot water. Start with 1/4 teaspoon and work up from there. You can also use triphala in tincture form. I don’t recommend using any herb indefinitely. Though triphala is safe to use long term, it’s good to stop use every few months for several weeks to give it a rest, or it loses effectiveness. 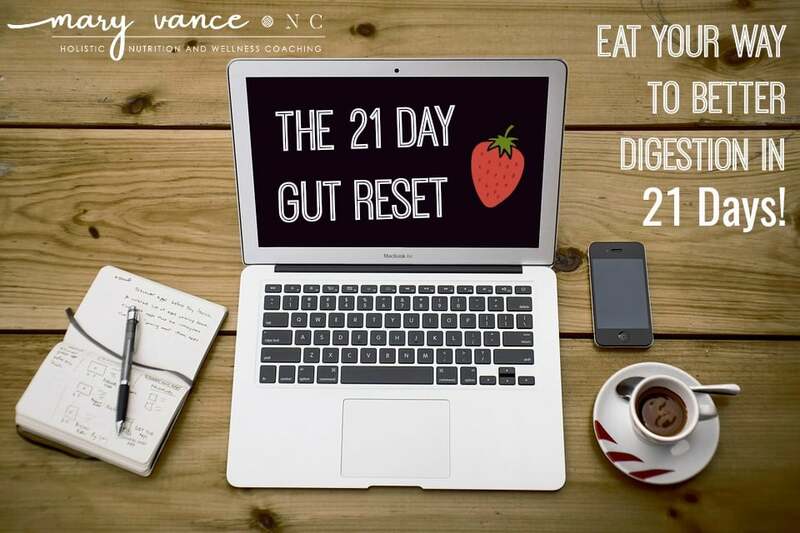 If you experience any GI side effects like stomach cramping or loose stool, cut back your dosage. The dose will be different for everyone. 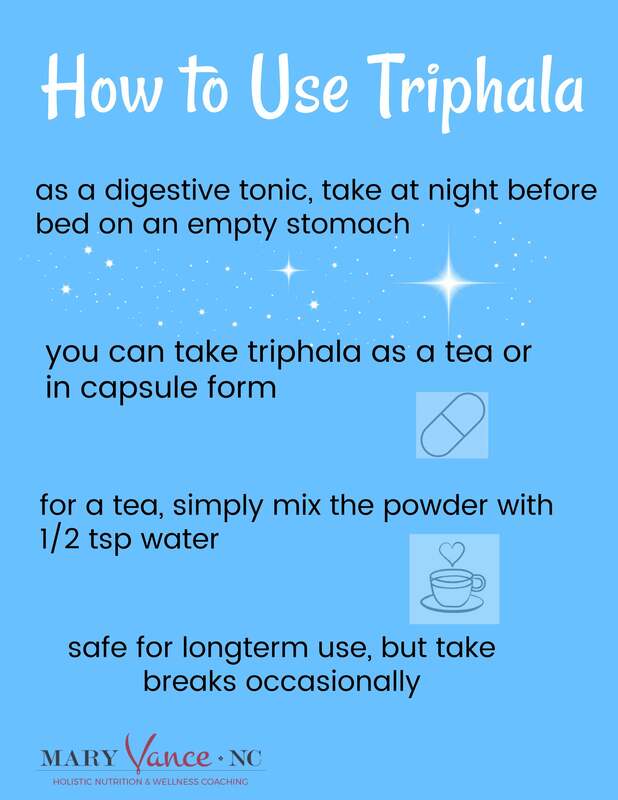 Do not use triphala if you struggle primarily with diarrhea. Don’t take it if you use blood thinners. As always, check with your primary practitioner before taking a new herb to make sure it’s suitable for you, especially if you’re on other meds. Do not take while pregnant. Finally, triphala may be dehydrating. If you notice excessive thirst when taking it, decrease the dose. 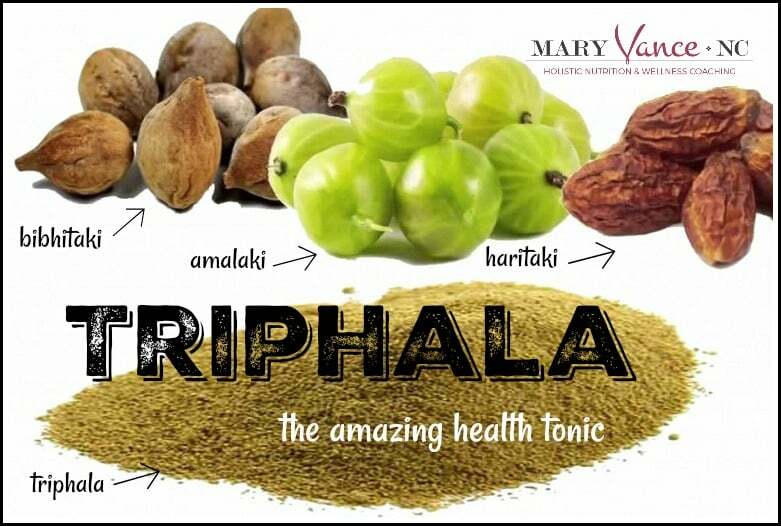 Have you used triphala? What have you noticed? This is interesting information! I haven’t done much in the Ayervedic- partially because it just always seemed a bit overwhelming. So I’ve never heard of this before. Thankfully I’m not needing it right now but I’ve been trying to get my dad off of his statins. He’s started doing some liver support supplements to hopefully address it, but if he doesn’t see some improvement soon, this might be my next recommendation. Thanks for sharing! Oh, and I think I spotted an error – on the image did you mean to say 1/2 tsp of water or 1/2 tsp of Triphala? That would be a tiny amount of tea! Sue, I link to the triphala I recommend in the post. Thank Mary for the very nice article. I heard the triphala is used to reduce the uric acid as well. Can you recommend which one to buy it?